It’s no secret that the cruise industry has transformed itself in recent years – shaking off outdated stereotypes and working hard to keep cruising relevant for the modern traveller. These days you’ll find cutting edge cruise ships with thrilling on-board activities and a wide range of state-of-the-art facilities as standard – and it’s not about to stop there. Cruise lines are already ordering world-class ships that will come into service in 10 years’ time, and to ensure they impress passengers in 2027 and beyond, innovation and forward-thinking is vital. So, what will the cruise ships of the future look like? Forget about one strategically positioned TV on the wall in your cabin. Soon, LED screens will feature on the walls, ceilings and even floors of cruise ships. Royal Caribbean has already created virtual balconies, bringing ocean views to every inner stateroom – but this is just the beginning. 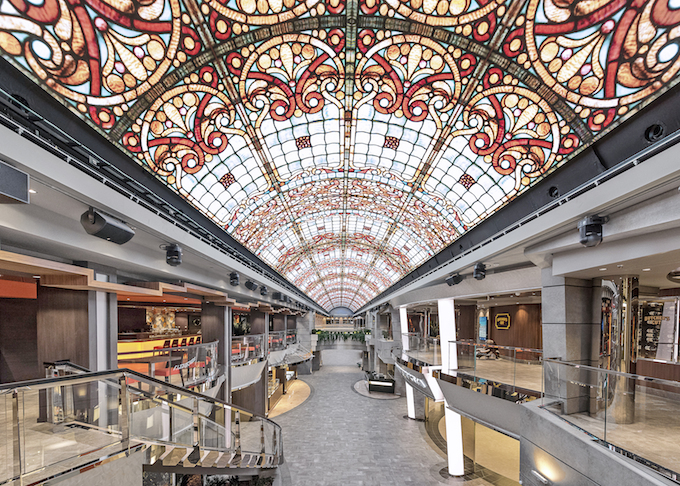 In the future, it’ll be the norm to use LED visual display technology to create illusions and enhance the ambience of the public spaces throughout the ship. Wearable technology has already been adopted by Princess Cruises, who have given their device a catchy name – Ocean Medallion – but, in the future, it will be used for more than just room access and paying for cocktails. As cruise lines look to provide a personalised experience for each traveller, devices worn by guests will inform bar tenders of a customer’s name and favourite drink, alert waiting staff if it’s someone’s birthday or anniversary and tailor activity suggestions based on repetitive behaviour of the wearer. Voice activated in-room assistants will act as personal butlers from the moment a customer enters their stateroom. Without lifting a finger, guests will be able to ask their assistant to make dinner arrangements, book last minute excursions or even have a hire car delivered to the port for when they dock. Virtual assistants will also make sure customers never get caught without sun cream or an umbrella again by giving an accurate weather report for the ship’s next destination. State-of-the-art engineering is enabling the cruise industry to take bold and exciting steps when it comes to futuristic design concepts on board. 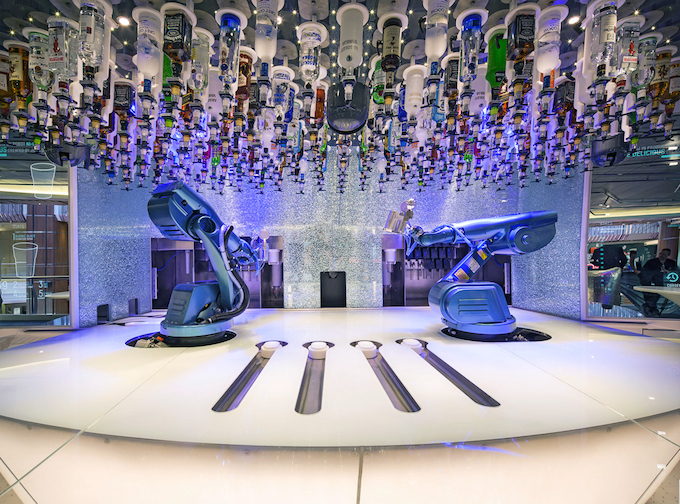 Royal Caribbean has introduced the ‘Rising Tide Bar’ which moves between floors as guests enjoy their cocktails and the ‘Bionic Bartenders’ – robots that mix your drinks. We expect to see many more incredible engineering ideas setting sail soon, many of which would be impressive on dry land let alone at sea. The first being the ‘Magic Carpet’ on the Celebrity Edge, which launches in 2018. The Magic Carpet is already causing ripples of excitement in the cruising world as it’ll be the world’s first cantilevered floating platform to hang off the side of the ship. As virtual reality technology becomes more advanced, it will be used to give customers a real-life experience of the destinations they are about to visit. Watching short videos will be long gone, replaced by the ability to experience the heat, wind and even local smells before travellers arrive. We also expect cruise companies to invest more in virtual reality gaming for children, and any big kids, onboard. Next-level technology will enable players to be present in a three-dimensional environment and interact with live characters or situations within the game. Cruise liners are already investing in environmentally-friendly initiatives around waste disposal and water efficiency to reduce their carbon footprint. The next step is to pay closer attention to the ships themselves to ensure the next generation of vessels will have as little impact on the environment as possible. Royal Caribbean’s Icon Class ships, planned for 2022, will be powered by liquefied natural gas and use fuel cell technology to reduce gas emissions. Plans are also in place for what is being dubbed the ‘World’s Greenest Cruise Ship’ which will use retractable solar panels and a future-ready hybrid engine. 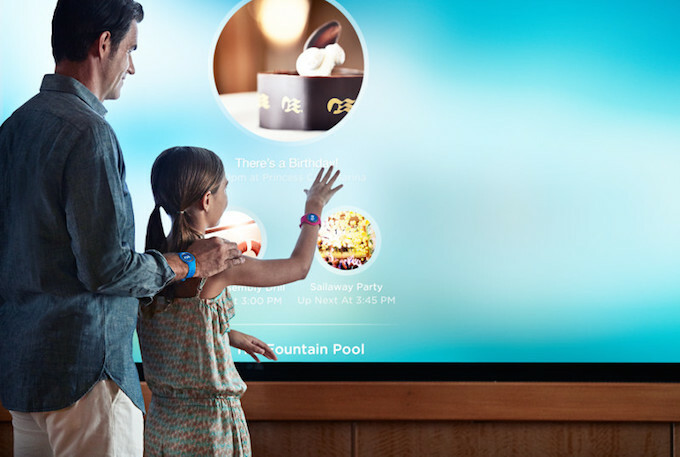 Friendly holographic staff will soon be available for real-time interactions with customers at hundreds of touch-points around cruise ships. Acting as virtual information points, the holographic helpers will give on board directions, answer customer questions and make important announcements to a crowd or a room full of people.